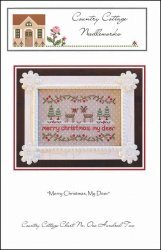 Merry Christmas, My Deer [H1894] - $8.50 : Yarn Tree, Your wholesale source for cross stitch supplies. Cross stitch pattern by Country Cottage Needleworks. Two deer are standing in the center surrounded by decorated trees. "Merry Christmas, My Deer" is below them. Greenery with red berries border the winter scene. Stitched on #7168 Belfast Linen Petite Point raw with white dots. Stitch count 134w x 85h.